This entry was posted on February 14, 2013 at 11:40 pm and is filed under martial arts for kids. You can subscribe via RSS 2.0 feed to this post's comments. i always try to emphasize that the skills of success include focus, determination, and dedication. While training in the martial arts the individual must concentrate on themselves while others around them may be doing something different. The martial artist must control his mind, body and spirit. They must show determination in every move. The martial artist must be dedicated to succeed. He/she must attend classes 3-4 times per week to accomplish their goals. The martial arts classroom is a mirror to the real world. The elements for success in the dojo are the same ones necessary for success in college or in a career- Dedication, desire and discipline. WARNING, READERS! That link takes you to an EXTREMELY ad-saturated, multiple-pop-up-generating site. Highly recommended reading for our high school students! 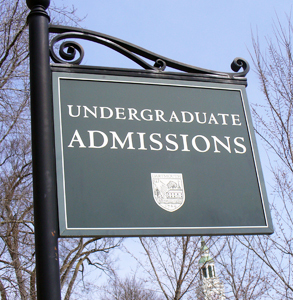 I thought this was a great, informative article about how college admissions officers view martial arts as an extracurricular activity on college applications. Like any activity on an application, it’s crucial that you provide details about yourself, your training, and what your focus is (and why that’s important to you), in order to showcase the strength of your character. Quite an insightful article. I think the answer is yes. It’s a plus and in my case, i think it helped me improve my appeal as an applicant for work. I’m sure the same effect can happen to college application. Agree that details have to be considered but all in all, you need a good story to tell thay shows the kind of character that was molded with the timeless values of karate. Yes, a black belt in karate can help you get into college. Along the journey to apply to college you must stay focused, have a goal, be disciplined to finish your projects and go to your classes. These are the skills that you practice every day in a martial arts class. You must have a goal in mind, getting your black belt. You must attend class regularly to accomplish that goal. And you must be willing to put out the sweat and tears to get the black belt. So, when you put down on your application- black belt- you might also add, “X” number of years training, focusing, sacrificing. These are the character traits of a successful person. Reblogged this on PNG Warrior. Thanks – hope it reaches more students who might find it helpful! Reblogged this on The Journey to Extraordinary.